We are a full-bore rifle club affiliated to the NRA (No. 174) and operate under the approval of the Scottish Government (Ref. DDG 5/5 N1). We shoot regularly at our range on Cawdor Estate at distances up to 600yds. We shoot all year round, weather permitting. Our range days cover all types of firearms and we have a selection of competitions - some more serious than others - to encourage participation at all levels. The first full-bore competition was held on a pleasant day with some very interesting wind conditions. Congratulations to the winners, F/TR George Miller 72.5, TR Mark Ferrari 66.4 and SR Kevin Dann 54. Eleven shooters took part on a fine, sunny day. Competition was close, but Paul Furness took the honours with 143 ex 150. We will now revert to normal range times, aiming to commence shooting at 1000, so please arrive around 0900-0915 to get range set up. Remainder of the dates for the year will go onto Dutyman either tonight or tomorrow. 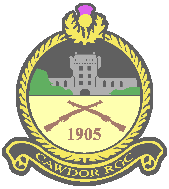 2019 AGM is 1917 on April1 in Cawdor Community Centre.